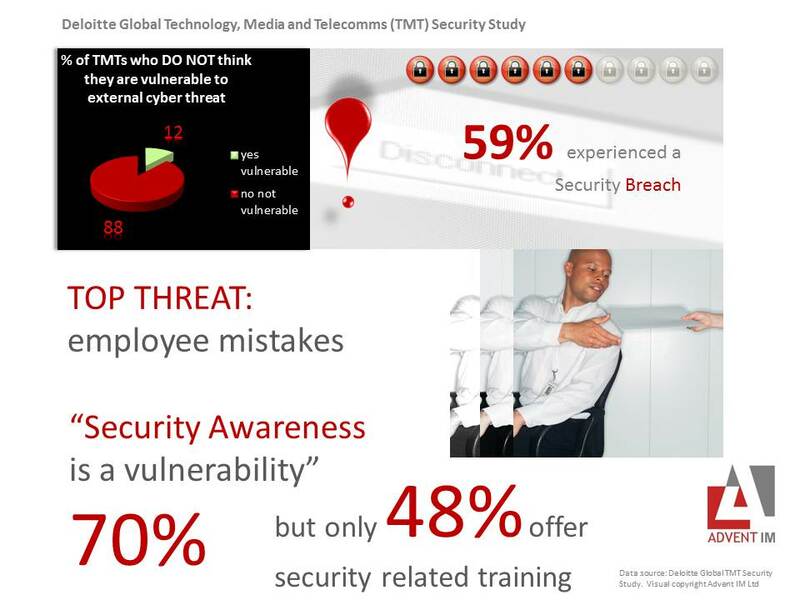 9 out of 10 TMTs think they are not vulnerable to cyber attack…think on..
s disappointing that having acknowledged that employees are a real issue, only 48% of businesses offer Security Awareness training. This is creating vulnerability needlessly. Security Awareness should be an integrated part of business. Having said that the tendency to push Security onto IT is part of the problem. IT can look after IT security but information has to be safeguarded in all its forms and that means anyone who uses it has to be responsible for its security. That means all employees have a part to play. This also explains why employees are the top threat to security. 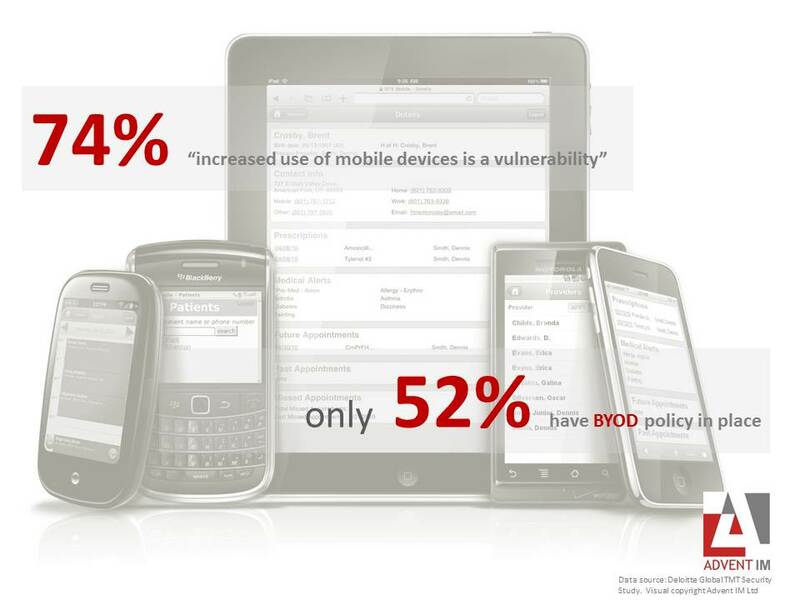 There is a growing awareness of the potential threat from increased use of mobile devices. The co-existence of personal and business data and applications make mobile devices highly prized for theft and also marvelous new entry points for a cyber attack. Figures from a previous survey from Ponemon Institute showed that the majority of respondents carried sensitive data on mobile devices ‘frequently or very frequently’ , yet the same survey showed that over a third of data breach had come from lost or stolen devices and that almost 60% of employees spent no time whatsoever on data protection activities. This entry was posted in BYOD, consultancy, cyber attack, cyber security, data breach, data protection, data protection act, data protection directive, expert security, hacking, information security, IT, security, security advice, security awareness, security consultants, training, Uncategorized and tagged Advent, BYOD, cyber attack, data breach, data loss, data protection, data security, deloitte, disaster recovery, employee threat, Global TMT Survey, hacking, information security, Insider threat, IT, malice aforethought, ponemon, ponemon institute, risk assessment, Security, security awareness, security awareness training, security threat, technology on January 16, 2013 by Ellie Hurst.